Yeah let's stop here for a moment. American cottage cheese doesn't work for this. What you do is make some the Hungarian way: pour some full-fat milk (the fatter the better) and some live-culture yogurt of kefir into a pot and then let it sit until it turns into the consistency of thick pudding. When it is done, put it on the stove and slowly heat it just to the point of "it's about to boil", and then turn it off. Pour it through a cheese cloth and hang it up to drip until it is not dripping anymore. What you have left in the cheese cloth is, hopefully, cottage cheese. 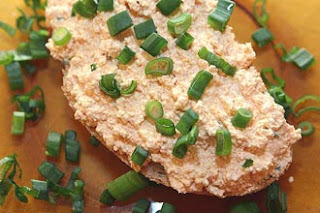 Now you can mix it with some sour cream to make it more creamy and spreadable. Veteran Hungarian-Americans tell me you can skip this part if you simply use classic Philadelphia cream cheese (and you can add some butter). I have not tried it yet but it sounds like it could work. Once you have the creamy base, you can move on to the spices. Add paprika and caraway seed (or cumin, I have accidentally tried that too, thank you Hungarian-English dictionary, but it was not bad at all), and pepper if you want. Also chop up some white or red onion into tiny pieces and mix it in, and do the same with a piece of garlic. I am not writing exact amounts because it is up to everyone's own taste (my kőrözött usually ends up being a pot of onions and garlic with some cottage cheese on it). That's it, you are done. Spread on a piece of bread (and respect the food, please don't use pre-sliced, good onions died to make this). Enjoy! You can keep it in the fridge for a day or two, it usually tastes better a few hours after being made, when the onions have let out some juice. It is quite healthy for Hungarian cuisine.